The UK is opposing new EU recycling targets during negotiations in Brussels, despite pledging this month to develop “ambitious” recycling goals. This month, Theresa May revealed the government’s 25 year environmental strategy, which included a promise to meet all current waste and recycling targets and to develop ambitious new ones, as well as action to reduce single-use plastics and increase plastic recycling. Michael Gove has also promised to crack down on plastic waste, after saying he was “haunted” by footage of plastic pollution in the oceans in the BBC’s Blue Planet II. 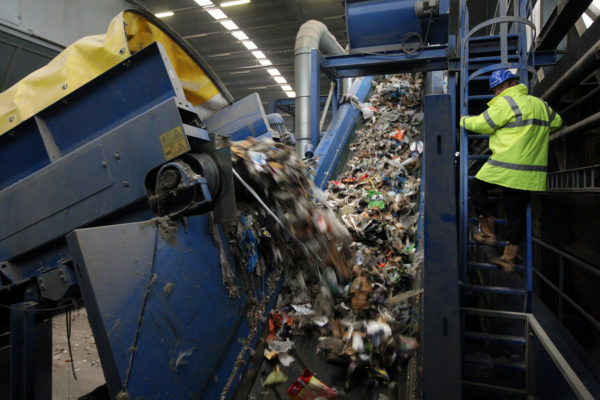 But leaked notes from an EU delegation seen by Unearthed reveal that UK officials told their counterparts the country will be unable to support an EU-wide target of recycling 65% of all municipal waste by 2035. Diplomats from three other EU nations, speaking on condition of anonymity, agreed that UK officials had voiced opposition to the binding recycling target. One told Unearthed the UK had been “quite blunt”. The UK is set to leave the EU in March 2019, and it is not yet clear whether Brexit will mean it avoids having to adopt the recycling target altogether. Labour environment spokeswoman Sue Hayman said the government was trying to “scupper progress on recycling targets behind the scenes”. Under the current laws, EU nations must achieve a legally binding recycling rate of 50% by 2020. Despite significant improvements over the past decade, the UK’s recycling rate has recently stalled at around 44%. An internal Defra analysis from July 2017, seen by Unearthed, estimates that increasing the UK’s recycling rate to 65% would save the waste sector billions of pounds by 2030 and could save thousands of tonnes of carbon emissions by 2100, as well as bringing about billions in social savings. But the presentation notes the UK’s recycling system would have to be totally overhauled to reach this level. Unearthed understands the presentation shows an incomplete analysis, and the figures have since been revised. What are EU recycling targets? Under current EU rules in the Waste Framework Directive, member states are expected to recycle 50% of municipal waste – that’s everyday rubbish thrown away by the public and by businesses – by 2020. Six member states have already hit the target, with Germany already recycling an estimated 66% of its municipal waste. The EU is proposing to increase this to 65% by 2035, including 50% of all plastics. Member states face fines that can amount to millions of pounds if they miss the targets. The new recycling targets are in the Waste Framework Directive, a package of laws on waste and recycling that is working its way through the EU legislative process as part of the Circular Economy package. Unearthed has previously revealed how supermarkets and soft drinks brands lobbied Defra to oppose aspects of the circular economy package including strict new “polluter pays” rules, and deposit return schemes, where customers pay a small amount for drinks containers, which is returned when they recycle the bottle or can. Last month, after a negotiating session lasting 18 hours, the European Council and European Parliament reached a provisional agreement on the Waste Framework Directive, which includes recycling targets. This is expected to be finalised in the next month. At a debriefing meeting for national representatives in Brussels in the days after the agreement was reached, “the UK stated it is unable to support the agreement because of the municipal waste recycling targets,” according to notes taken by another delegation and shared with Unearthed. However, a European diplomat said the deal is at a fairly early stage and could still change. A Defra spokesman said: “The government will make a decision on its vote following close scrutiny of the proposals, which are still provisional. Labour shadow environment spokeswoman Sue Hayman told Unearthed: “This Conservative government must be judged on what they do, not on what they say. When it comes to the environment, we have seen this prime minister support fracking beneath national parks, continued subsidies for fossil fuel extraction and illegal levels of air pollution reaching crisis point.